#KnitPetiteProject: Your personal variety of modifications; what are they, and how do they differ from the sizing charts? Our last post where we looked at petite plus fit issues. In May we touched on diagnosing fit issues, and comparing them to the often utilized CYC sizing charts. I insert this quote not to make you feel intimidated, but instead to emphasize that we’re all different, and that you always have to check the evidence your body gives you against any guidelines. Our end goal is to be proactive in our choices and alterations of knitting patterns so that we can make informed decisions before purchase, and have an understanding of what we can and want to alter within any given pattern to deliver our desired fit. To make that happen, a good first step is to be aware of our own body’s shape; this is not necessarily easy or simple to know! 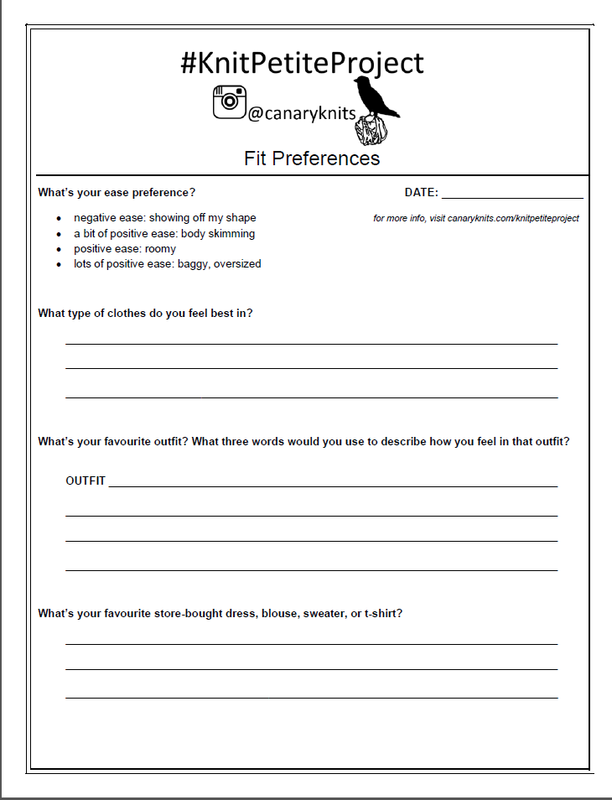 Just think about what we’ve already addressed in the #KnitPetiteProject, and the evidence given to us through the responses to the fit survey! Because this is such a hugely variable topic, it’s useful to have an example to point to. And of course, I can always find a willing participant in… myself! So forgive me for splashing my face here again in order to illustrate a point. One of the tools I’ve used to help gain some objective perspective on my own shape is creating a Body Graph through the methods outlined in Alto and Palmer’s book, Fit for Real People. I’ve referenced this book before; I know we’re all knitters here, and that this is a book for sewists, but I still want to recommend it to you all as a great source of information about fit and gaining an understanding of your shape and diagnosing fit issues. Plus, I think it would be a fantastic exercise for us to share about in the #KnitPetiteProject Ravelry group so we can all learn together! So, here’s my experience creating the graph, interpreting it, and how I want to use this information moving forward. I’m not giving away all the steps and charts, as that’s copyright material from the book. But I will say that they guide you very clearly through how to stand, how to get your friend to mark your shape at about 10 different points, and then how to subsequently fold up that paper into 8 equal chunks for interpretation. You may wonder why we need a belt and a necklace? Wearing those two items helps to mark out a couple points on your body that would otherwise be a bit tricky to note (where your neck meets your shoulders, and your waistline). As I mentioned earlier, the authors of Fit for Real People are using the home sewing sizing charts as their comparison. These aren’t exactly the same as every knitting pattern you’ll come across, but because they give you a firm set of numbers, you can compare this information against whatever information you find on a knitting pattern schematic. There’s useful interpretive information sprinkled throughout the book, but the pages most directly connected to this are 67 – 71. Me with my Body Graph! In the book there’s a full Body Graph worksheet where you can input all the interpretations of your shape (ie: short waist, sloping shoulder, etc). This is a tool I can return to in order to consider proportions, but also, and most applicably to us knitters, the Body Graph can be an incredible resource of the information needed to achieve fit goals in a very visual way. The graph gives you a 2D visualization of your shape, but upon it you can also note the 3D measurements that are important to fit and sizing. As I listed above, it gives you an understanding of those vertical measurements and your proportion (ie: short waisted? broad shoulders?). It’s also relatively easy, inexpensive, and low-tech to create. I’ve tried doing similar shape-interpretation exercises with photographs; these are interesting, but I’ve found them more time consuming and ultimately less accurate than an actual tracing of your own body. I’ll be using this graph throughout the rest of the year in the #KnitPetiteProject to illustrate how we can take control of our knitting and get the fit we want. On a personal level, I’ll be using these charts to re-examine my choices and aesthetic preferences, along with deciding on my personal variety of modifications along with the information we touched on in May. 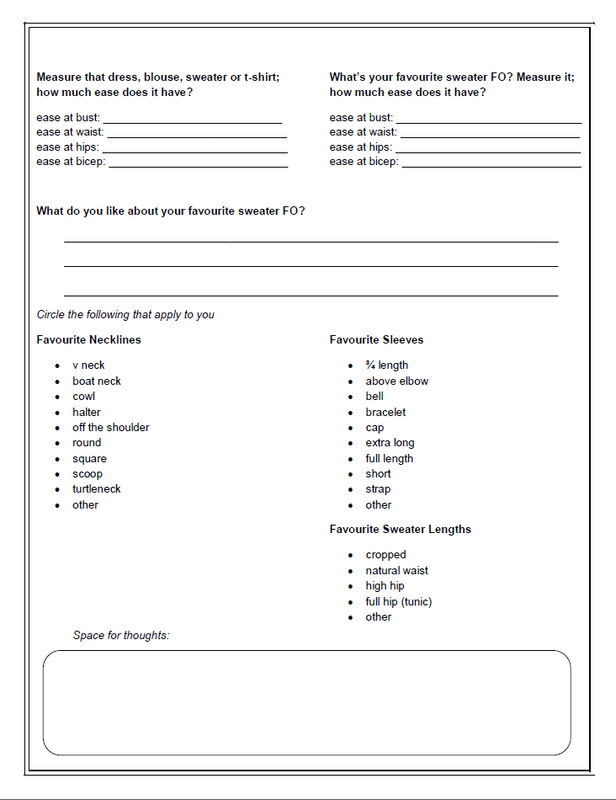 All this preference and shape examination is wonderful, but to get at the heart of our issues as petite knitters we need to know what and where the fit gaps are. In May we touch on diagnosing these issues; here, I want to encourage you to not only look at the CYC numbers, but also a specific pattern design. We’re getting very practical and hands-on this month! Come next week to the #KnitPetiteProject prepared with your chosen sweater pattern and your measurement, shape, and fit preference information! I’m looking forward to working and learning with you. Please consider joining in these conversations on the #KnitPetiteProject Ravelry group so we can all learn and share together. Interested in creating your own Body Graph? Join us in this #KnitPetiteProject Ravelry group thread and let’s get learning together! 2 Palmer, Pati and Marta Alto. Fit for Real People. Palmer/Pletsch Publishing; 2 edition. September 2006, pg 127. ← #KnitPetiteProject: Petite Plus; what are the fit issues, and how do they line up against sizing charts?